Item description: In 2000, Chronoswiss launched their ‘Timemaster’ range of race/rally drivers watches. This example is one of the original edition from that period, with the original Chronoswiss certificate dated September 2001, and signed in green ink personally by company owner, Gerd Lang. Initially there were just two versions of the watch, which were named ‘Day’ & ‘Night’, for obvious reasons, as the dials were either black or white. The watch has a large stainless steel case with brushed and polish finishes. along with a milled rotating bezel ring, and large crown for easy use whilst driving. 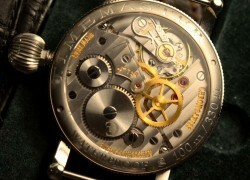 The dial is black and with luminous battons and Latin hour numbers at the 12, 3, 6, 9. 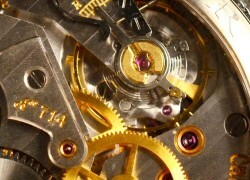 The reverse has a crystal glass back to expose the beautifully finished calibre 672 movement. The movement with Geneva Stripes, and movement number ‘714’ (showing it is the ‘714’ th movement off the line. Additional description: In addition to the watch, is the original aluminium Chronoswiss branded carry case, along with cardboard outer packaging. Inside the case, is the Chronoswiss certificate and instruction book, Warranty certificate for waterresistance, card for Chronoswiss General Agents. The watch comes with two seperate watch straps. 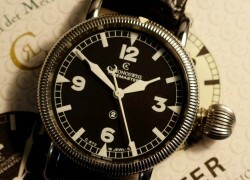 One in black crocdile, and bearing a stainless steel Chronoswiss branded buckle, the second, a large brown vintage style strap which can be worn over race / rally overalls, or leather cold weather clothing. Typical of Gerd Lang’s obsession with detail, the case also includes a container with all major repair parts for the movement of the watch. 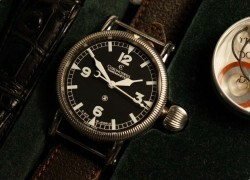 The original Chronoswiss seals are also in the case. Condition report: Mint condition, storage age only. Background to Chronoswiss: The Chronoswiss company was founded by Gerd R. Lang in 1983, with the mission to make the most extraordinary mechanical timepieces. Prior to founding Chronoswiss, Lang had gained significant experience in manufacturing movements for other major brands, such as Heuer. 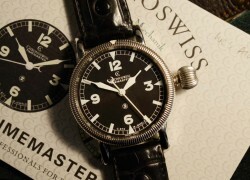 Chronoswiss maintain exclusivity by producing only about 7,000 watches per year. All watches are hand-finished. While many of the movements used in Chronoswiss watches are based on the Enicar 165 movement, the Chronoswiss versions feature significant improvements, both technical and aesthetic. Although a relatively new brand, innovative timepieces have continued to earn Chronoswiss significant respect within both the horological industry, and among collectors. Founder Gerd Lang is well known for his love of detail, and their highly detailed crowns, bezels, and casebands are some of Chronoswiss’ distinguishing features. Special notes: This is a very adaptable watch. It looks at its classic best with the aviator style leather strap, or in a more modern context with the black crocodile strap. The watch is ideal for motor racing /rallying use, and has a hacking seconds. Provenance: Only the initial 1000 pieces had certificates hand signed in ink by company owner, Gerd Lang. After that, the certificates had a printed signature.